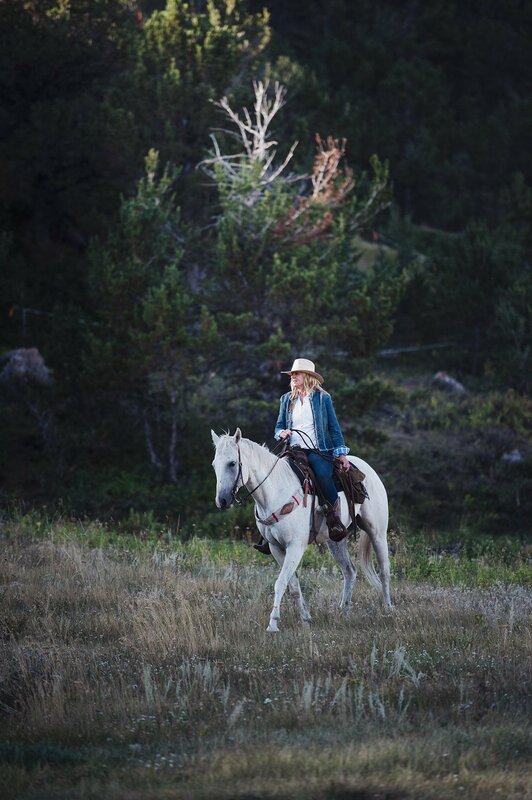 Hidden amongst the sapphire jewels of the Little Belt Mountain range lies a different kind of treasure: Montana Cowgirl Camp. This retreat, nestled in the hills overlooking sweeping views of Montana’s heartland, is the perfect escape for those who want to get lost and find themselves. The romantic and rugged terrain is not designed for the weak of heart, but remains home to the humble, strong-willed few who inhabit this land. Visionary hostess and owner, Jeana Noel, has created a sanctuary for those willing to brave the wind and thorns and have their breath taken away by the wildflowers, sunsets, and sheer vastness of this otherworldly land. The first obstacle one encounters on their journey to Cowgirl Camp is the cool, flowing waters of the Judith River. The river’s significance is not only physical, but also metaphorical: it marks the borderline between civilization and the mountainous heart of Montana. Upon crossing the gentle waters, one is immediately transported to a different time and place, and the freedom to become the wild, untamed woman you’ve always dreamed of is suddenly attainable. 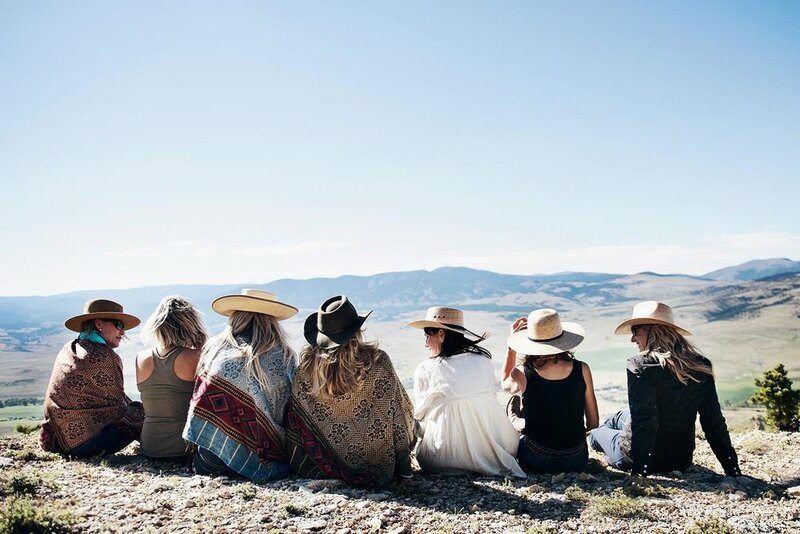 Famed Greek philosopher, Heraclitus, once said that “no man ever steps in the same river twice, for it's not the same river and he's not the same man.” This can certainly be said for the women who cross the Judith River to attend Montana Cowgirl Camp. We all arrived as one thing, and left as another. The changes may be subtle, but they are absolute. Like a flowing river, everything changes, and nothing stands still. All who attend Cowgirl Camp possess the desire for a truly unique and meaningful experience. A daring heart is an essential prerequisite for Cowgirl Camp, and true adventure is the reward in-wait for those willing to step outside their comfort zone. The days spent up here, away from the bustle of everyday life, somehow exist on an elevated plane. The memories made remain firmly planted in the mind long after your stay, and they don’t fade easily with the passage of time. What we take from our experience varies, but we always return with more than what we came with. Cowgirl Camp touches something deep within us- something intrinsically nourishing and irrefutable. We all hope to learn and grow with the passage of time, and the mountains and wilds of Montana seem to accelerate this growth within us. There is much to be said for the company we keep in the mountains. Our collective ability to survive, and thrive, in the natural state is a tradition that’s written in our blood. It’s been passed down from our ancient ancestors, and we can still get in touch with it if we take the time to try. There is nothing as quintessentially American as taking to the mountains in search of one’s self, and there is no experience quite like it. Back in civilization, we all possess characteristics that align us with certain groups and cliques. We may spend our days working at home as caring mothers, toiling in the office as executives of powerful companies, or as artists searching for the deeper meanings of life. We arrive at Cowgirl Camp carrying these preformed notions of who we are with us, but over the course of a week in the mountains, we evolve. We cast off the lines that tie us to our civilized roles, and we grow wild, free, and uninhibited. We find something that’s been lost along the way, and we become the cowgirl that’s been hidden deep within us. Emerald greens and dusty, faded earth-tones hold sway over this rugged landscape. They work their mercurial magic on the hearts and souls of the women at Cowgirl Camp, and we change to match our surroundings. The ubiquitous neon and incandescent lights of cities and towns are replaced by fireside glow and moonlight. Thoughts are given room to breathe, and an empty glance becomes a contemplative gaze. A quiet conversation builds to roaring laughter and echoes off of noiseless hills. We are alone together, and the magic is felt by all.